Hannan senior Lindsey Holley (14) applies defensive pressure to a Buffalo player during the second half of Wednesday night’s girls basketball contest in Buffalo, W.Va.
BUFFALO, W.Va. — Basketball isn’t a bakery. 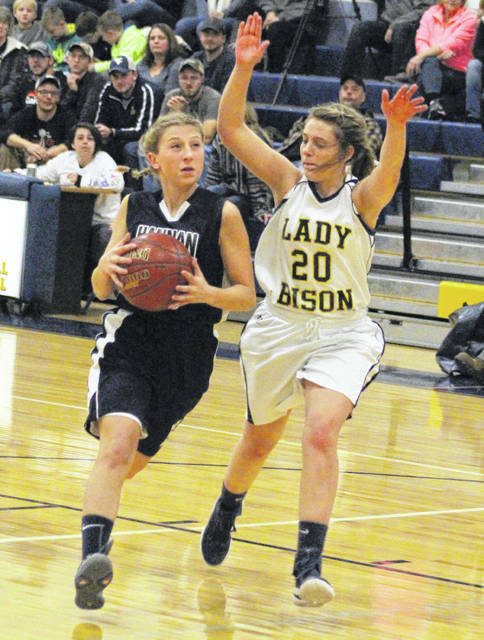 Turnovers once again plagued the Hannan girls basketball team on Wednesday night during a 32-27 setback to host Buffalo in a non-conference contest in Putnam County. The Lady Cats (1-8) committed 26 turnovers in the contest, twice as many as the Lady Bison (1-9) — who ended up claiming their first taste of success thanks to guests’ generosity. Those extra opportunities proved particularly beneficial in the first half as Hannan coughed the ball up 14 times, allowing the Blue and Gold to lead by as many as six points in each of the first two quarters. The Blue and White never trailed by more than two possessions in the entire contest and managed to keep things competitive throughout — even though the Lady Cats never held a single lead. In the end, however, mistakes ultimately came back to haunt the guests after managing only one more point than turnovers in the hard-fought outcome. Naturally, HHS coach Kellie Thomas was disappointed in the final outcome afterwards — particularly with a repeating theme that keeps leading to similar results. “It came down to turnovers once again. When you give the ball away 14 times in the first half and have another eight turnovers in the fourth, things just aren’t going to go your way,” Thomas said. “There’s just no excuse for it. We dug ourselves a hole and we couldn’t get out of it. The Lady Cats had six of the nine turnovers in the opening canto while also falling behind by counts of 4-0 and 8-2 before trailing 8-3 through eight minutes of play. BHS followed with a 2-1 run to take a 10-4 edge with 6:16 left in the half, but Hannan — despite committing eight turnovers — answered with a 7-2 run over the final 5:09 while closing its halftime deficit down to a single point at 12-11. The Lady Bison opened the third quarter with a basket, but Pammie Ochs countered with a trifecta to tie the game at 14-all with 6:25 remaining. Buffalo countered with a 6-3 run over the final 5:10 to secure a slim 20-17 cushion headed into the finale. 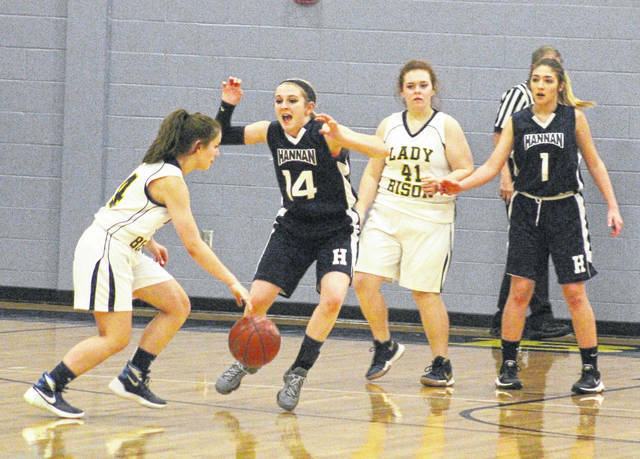 HHS whittled the lead down to a single on five different occasions down the stretch, with the last occurrence coming with 1:14 left after a basket by Bailey Coleman. The guests, however, went scoreless the rest of the way as Buffalo netted 4-of-6 free throw attempts over the final 1:06 to wrap up the five-point triumph. Hannan — which has now dropped four straight decisions — outrebounded the hosts by a 38-32 overall margin, including a 10-8 edge on the offensive glass. The Lady Cats connected on 8-of-40 field goal attempts for 20 percent, which included a 3-of-14 effort from behind the arc for 21 percent. The guests were also 8-of-13 at the free throw line for 62 percent. Coleman led HHS with eight points, followed by Halie Johnson with seven points and a team-high 11 rebounds. Ochs was next with five points and Lindsey Holley added three markers. Bailey Tolliver and Julie Frazier completed the visiting tally with two points apiece. McCoy and Frazier also hauled in eight and seven boards, respectively. The Lady Bison netted 12-of-50 shot attempts for 24 percent, including misses on all 17 of their trifecta tries. The hosts were also 8-of-18 at the charity stripe for 44 percent. Emily Reilly paced BHS with a game-high 10 points, followed by Brooke Slaubaugh with eight points and a game-high 13 rebounds. Joni Smith was next with six points, while Kelsay Templeton and Hailey Williams rounded out the winning score with four markers apiece. Hannan returns to action Monday when it travels to Covenant Christian for a 6 p.m. contest.